[Editor’s note: The American Alpine Institute has teamed up with the American Climber Science Program to support a variety of important research projects in mountain environments. High mountain regions – especially those with glaciers – are a treasure trove of important data that can reveal a lot about the functioning and health alpine ecosystems and their individual components as well as inform upon large-scale phenomena like climate change. Click here to read about the Institute’s commitment to alpine research and that research’s potential for helpful impact on social policy (e.g., land management) as well as more on the research to be done by the author. After 12 hours on two airplanes and 8 hours on a bus, my group of approximately twenty students and two professors made it to Huaraz! There we met up with some volunteers from the American Climber Science Program as well as several researchers from other universities who will be working with us. We stayed at a cozy hotel called Familia Meza for our acclimatization days, during which we explored Huaraz and surrounding areas while getting used to the elevation (3,050 meters or 10,010 feet). The highest elevation we reached during our acclimatization was 4,450 meters / 14,600 feet, and following the "climb high, sleep low" rule, we returned to Huaraz for the night. Our first base camp, in the Ulta Valley, will be at about 4,200 meters / 13,780 feet. Some of our group, including myself, struggled a bit with altitude sickness. We learned the importance of rest, hydration, and positive pressure breathing exercises, and the usefulness and effectiveness of using Diamox (acetazolamide) when experiencing symptoms of acute mountain sickness (e.g., general malaise, loss of appetite, headache). 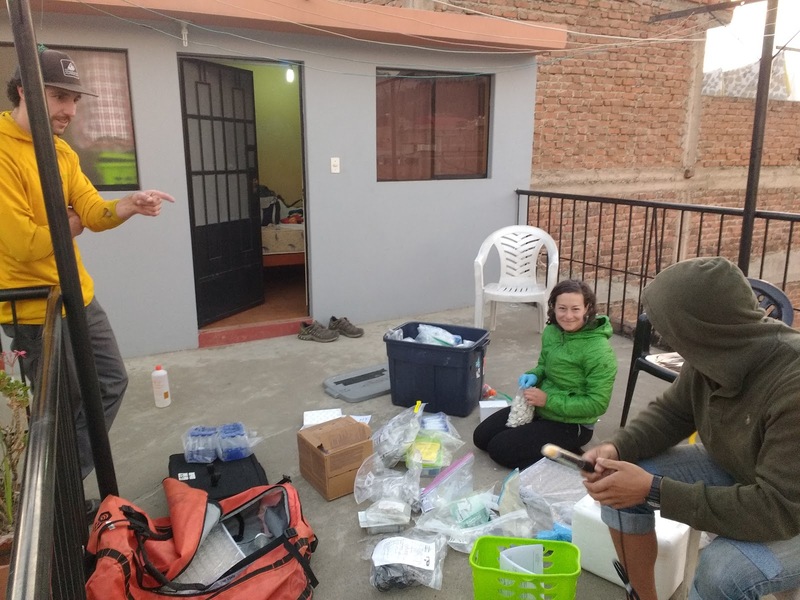 We have a six-member medical group within our expedition (including myself, three other students, and two professors) all of whom have a Wilderness First Responder certification or higher. One of our jobs is to check everyone's blood oxygen saturation, heart rate, and blood pressure every morning and night to identify anyone having an abnormally hard time acclimating. Our first two days in Huaraz were "take it easy" days, during which we alternatively explored the town and hung out at the hotel. We went on a short, slow-paced hike on the Cordillera Negra (a range parallel and to the west of the Cordillera Blanca) on our third day to get used to hiking at altitude. On the fourth day, we visited the Lazy Dog Inn and Centro Yurac Yacu. The Inn is a sustainable bed and breakfast/Ecological Inn that was started by a Canadian environmental scientist named Wayne and his wife Diane. With the help of neighbors, they built the entire place by hand and are now entirely self-sustaining in terms of both energy and food – and they generate zero waste. Additionally, they started the grassroots organization Andean Alliance, which is involved in local community development. We saw this organization at work at the Centro Yurac Yacu, which includes a school, a restaurant, and a textile shop. 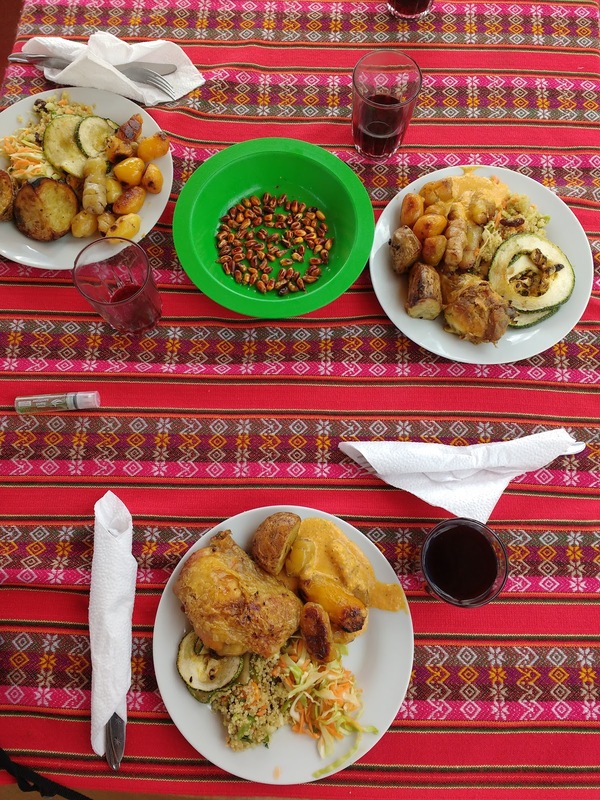 During our visit, the women at Yurac Yacu made us a Peruvian lunch which was by far the best meal I've had yet on this trip. It helped that every ingredient came from their farm! It was really inspiring and refreshing to see how smoothly and effectively they operate in keeping with their goal of environmental stewardship and super-low-impact community development. Lunch at Yurac Yacu: chicken, potatoes, tubers, zucchini, quinoa salad, cabbage salad, and chicha (a purple corn drink) all fresh from the farm and homemade! Later that day, we checked out some nearby pre-Incan ruins at Wilcahuain National Monument which were constructed during the Wari Empire (600-900 a.d.). Checking out the tiny rooms inside the Wilcahuain ruins. We had to crawl through 3-4 foot tall doors to get in. For our last day while based in Huaraz, we went on a high altitude hike up to Lagos Churup, where we reached a final elevation of 4,450 meters / 14,600 feet. It was, as our trip leader John calls it, a "lung crusher," but reaching the top was more satisfying for me than a much longer and steeper hike at sea level. On our way up to the lake we were treated to close-up views of Churup Peak. We spent the rest of the day resting, replenishing lost calories, and preparing our science gear for departure in the morning. We head to the Ulta Valley on Monday morning where my research group will be taking water samples of streams and lakes. I am looking forward to sleeping in my tent and using some of our new science gear such as the field microscope. travel-sized baggies to make hiking to high altitude sampling sites possible. teaches group members some knots and procedures for glacier travel. Photo by Penelope Kipps. their English with us just as we wanted to practice our Spanish with them. Photo by Penelope Kipps. The beginning of the hike up to Lago Churup. Photo by Penelope Kipps. My next post will be a report on our first five days in the field.